LONDON (AP) — UEFA opened disciplinary proceedings against Arsenal and Cologne on Friday after crowd disorder marred their Europa League game. Arsenal also said it will conduct a review into how large numbers of Cologne fans gained access to the home sections of Emirates Stadium for the Group H match on Thursday. Kickoff was delayed for an hour because of the presence of thousands of ticketless Cologne fans around the ground, which made it hard for ticketholders to enter the stadium. It was clear during the match that many away supporters were sitting among Arsenal fans in the stadium, with some of them causing problems for stewards. 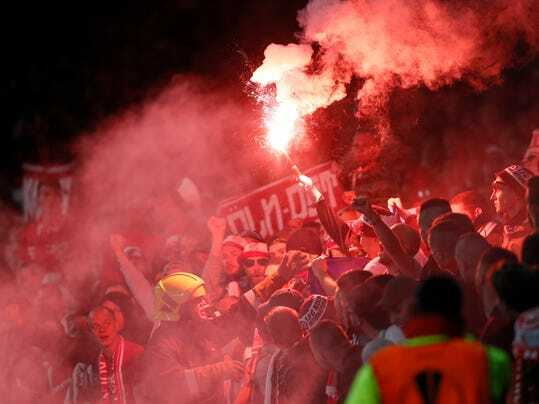 Cologne faces four charges from UEFA: Crowd disturbances, setting off fireworks, throwing objects, and acts of damage. Arsenal was charged with having stairways blocked in the away section. The case will be heard on Thursday. On Pro Basketball: Did Anyone Think These Warriors Would Have Trouble Meshing?